A motorbike daytrip for the adventurous! Tap into the local knowledge of your Khmer guide and make the most of his translator skills! Awesome day out. The guide was fabulous, and made the 2.5 hour trip from Siam reap interesting by stopping at local areas and markets - loved trying. local produce. Full day motorbiking tour This 145km Cambodian motorbiking adventure will not only seriously pump up your adrenalin and let you ride freely through the beautiful countryside but it'll give you a good dose of historical insight too! Up for an adventure? If you're feeling daring and want to really get off-road, we've got the perfect tour for you. Drive to the place where it all began, where Jayavarman crowned himself godking in 802AD. 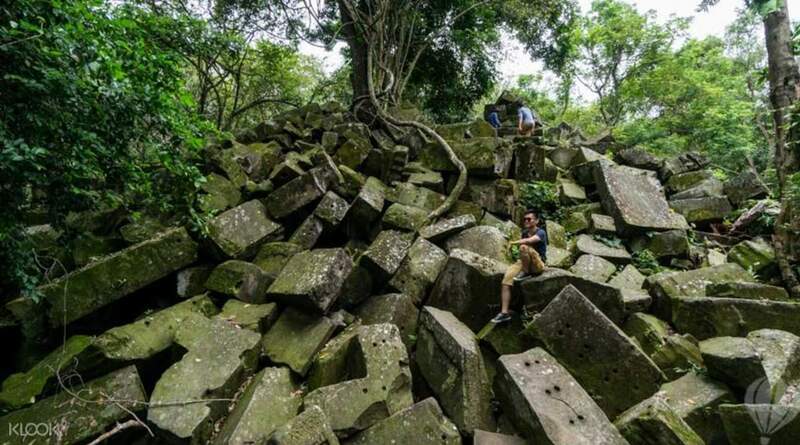 Rich in history, Phnom Kulen is where the ‘Age of Angkor' began, and is one of only two places in Cambodia where Buddha is reputed to have set foot. 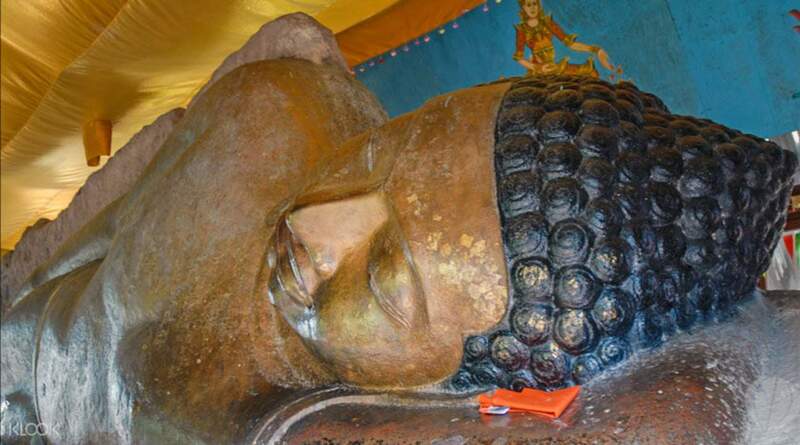 Visit a giant reclining Buddha and a scenic waterfall (don't forget your swimwear!) 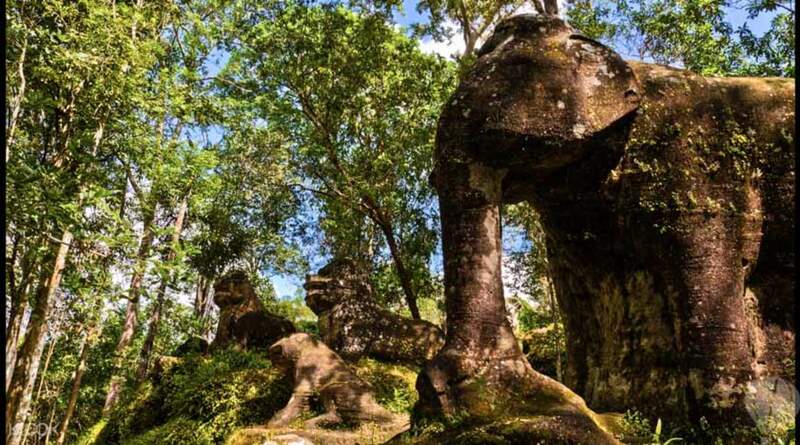 Then push on further, exploring kilometers of complex back trails, deep jungle tracks and hidden temples, including the stunning and sought-after stone elephant and lion statues. Tours are fully customizable, so if you want to take it easier, an alternative route takes you to the isolated pagoda of Preah Kral, with beautiful views of the Kulen Mountain plateau. This is the ultimate moto experience but if you're not feeling confident, not to worry, just hop on the back of the guide's bike instead. Definitely a must experience for travellers who want to veer from the typical Siem Reap tour. Guide was very kind and helpful and would even bring you to photo-worthy spots that are somewhat hard to find. This is more than your usual intense workout day but is definitely worth the nearly 10-hour motorbike ride. Definitely a must experience for travellers who want to veer from the typical Siem Reap tour. Guide was very kind and helpful and would even bring you to photo-worthy spots that are somewhat hard to find. This is more than your usual intense workout day but is definitely worth the nearly 10-hour motorbike ride. One of the best experience I had in Siem Reap for sure. Kdan, the tour guide, make the trip way better, funny, take us everywhere to try food and to see interesting things. I'll end up really dirty so use clothes you don't mind to get dirty. One of the best experience I had in Siem Reap for sure. Kdan, the tour guide, make the trip way better, funny, take us everywhere to try food and to see interesting things. I'll end up really dirty so use clothes you don't mind to get dirty. Definitely the highlight of my trip to Siem Reap. The guides (Chan and friend) were very friendly and fun. I was allowed to learn and practice riding a motorbike outside their house under their supervision before hitting the road. This tour was the best way to see the countryside (wandering cows, buffalos, mango farms, makeshift homes, etc.) and experience breathtaking views of the rural areas. 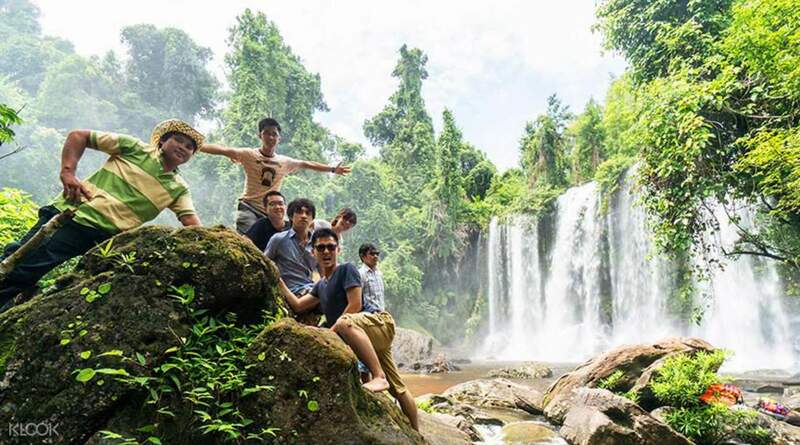 The trip up Kulen Mountain for the waterfall was nothing short of exciting as well as the ride down - I felt safe with our experienced guides who knew how to navigate the rocky dirt terrain. The reclining Buddha was worth seeing (built in the 9th century) as well as the Thousand Lingas for its shimmering spring lake (really small but beautiful). Above all, the company of the guides made it an excellent adventure!!! Highly recommend this trip! It’s not to be missed if you are visiting Siem Reap. Definitely the highlight of my trip to Siem Reap. The guides (Chan and friend) were very friendly and fun. I was allowed to learn and practice riding a motorbike outside their house under their supervision before hitting the road. This tour was the best way to see the countryside (wandering cows, buffalos, mango farms, makeshift homes, etc.) and experience breathtaking views of the rural areas. The trip up Kulen Mountain for the waterfall was nothing short of exciting as well as the ride down - I felt safe with our experienced guides who knew how to navigate the rocky dirt terrain. The reclining Buddha was worth seeing (built in the 9th century) as well as the Thousand Lingas for its shimmering spring lake (really small but beautiful). Above all, the company of the guides made it an excellent adventure!!! Highly recommend this trip! It’s not to be missed if you are visiting Siem Reap. Awesome trip. Awesome guides. Highly recommended. Thumbs up for our guides Mr Chan & Hdan. Awesome trip. Awesome guides. Highly recommended. Thumbs up for our guides Mr Chan & Hdan. Awesome day out. The guide was fabulous, and made the 2.5 hour trip from Siam reap interesting by stopping at local areas and markets - loved trying. local produce. Awesome day out. The guide was fabulous, and made the 2.5 hour trip from Siam reap interesting by stopping at local areas and markets - loved trying. local produce. The highlight of this trip was interacting with the locals and the motorcycle experience. Went into some local villages and had our eyes opened to what the real Cambodia was like. The guides Chan & Kedan made sure that we had plenty of time practicing on the motorcycle before we set off. The waterfall was alright but very crowded, maybe because we went on a weekend. Remember to bring your sunglasses, the guides provided a surgical mask and a lot of bottled water. All in all, we loved this experience and would highly recommend it. The highlight of this trip was interacting with the locals and the motorcycle experience. Went into some local villages and had our eyes opened to what the real Cambodia was like. The guides Chan & Kedan made sure that we had plenty of time practicing on the motorcycle before we set off. The waterfall was alright but very crowded, maybe because we went on a weekend. Remember to bring your sunglasses, the guides provided a surgical mask and a lot of bottled water. All in all, we loved this experience and would highly recommend it. Highlight of our trip! Our guides were so much fun, and so personable that they really made our day. We went on the trip not expecting much, but walked away with 2 new friends! They really took the time to show us all the local hotspots! If you're in Siem Reap, don't miss this tour! Highlight of our trip! Our guides were so much fun, and so personable that they really made our day. We went on the trip not expecting much, but walked away with 2 new friends! They really took the time to show us all the local hotspots! If you're in Siem Reap, don't miss this tour! Awesome tour! This tour really is a must do if you're looking for more than just sightseeing. I wasn't too familiar with riding a bike but got around to drive in about an hour of practice. My teacher/guide (Chan) was very friendly and patient with me and taught me the basics and looked after me throughout the trip. He was very knowledgable and explained about the culture, the buddhist temple, and the thousand lingas as well. The best part was to jump in the waterfalls after being on the road for 2 hours. It was such a great way to see Cambodia without being too touristy. Had so much fun on this trip. Highly recommended! Awesome tour! This tour really is a must do if you're looking for more than just sightseeing. I wasn't too familiar with riding a bike but got around to drive in about an hour of practice. My teacher/guide (Chan) was very friendly and patient with me and taught me the basics and looked after me throughout the trip. He was very knowledgable and explained about the culture, the buddhist temple, and the thousand lingas as well. The best part was to jump in the waterfalls after being on the road for 2 hours. It was such a great way to see Cambodia without being too touristy. Had so much fun on this trip. Highly recommended! If you are looking for an unforgettable adventure, this is the one. Get to see the real Cambodia as you ride through the scenic countryside throughout the whole journey. Highlight of the trip was the amazing waterfall. Avoid going during rainy season as the waterfall will then be too dangerous to swim in. It rained in the morning when I went and the waterfall became a mini Niagara Falls, but still managed to take a dip at the higher level. My guide (his name is Khadan) was super friendly and took good care of me. We chatted a lot throughout the entire trip and he didn't hesitate to stop whenever there was a photo opportunity. I would recommend riding pillion even if you know how to ride a bike as there are many bumpy roads to navigate throughout the trip. Let your guide concentrate on the roads so that you can enjoy the scenery. 10/10 would do this trip again. If you are looking for an unforgettable adventure, this is the one. 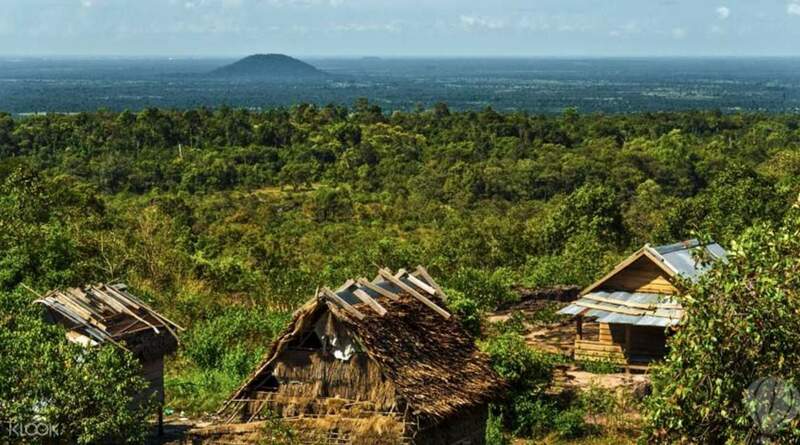 Get to see the real Cambodia as you ride through the scenic countryside throughout the whole journey. Highlight of the trip was the amazing waterfall. Avoid going during rainy season as the waterfall will then be too dangerous to swim in. It rained in the morning when I went and the waterfall became a mini Niagara Falls, but still managed to take a dip at the higher level. My guide (his name is Khadan) was super friendly and took good care of me. We chatted a lot throughout the entire trip and he didn't hesitate to stop whenever there was a photo opportunity. I would recommend riding pillion even if you know how to ride a bike as there are many bumpy roads to navigate throughout the trip. Let your guide concentrate on the roads so that you can enjoy the scenery. 10/10 would do this trip again. An unforgettable experience! This is certainly not for someone who has no motorbike skills, however the experience was still amazing as a passagers. The guides tried their very best to bring you to hard to reach places by motorbikes, its not a comfortable trip but for those who love adventure and a bit of craziness. Love it! The trip is certainly something that I will remember for life. An unforgettable experience! This is certainly not for someone who has no motorbike skills, however the experience was still amazing as a passagers. The guides tried their very best to bring you to hard to reach places by motorbikes, its not a comfortable trip but for those who love adventure and a bit of craziness. Love it! The trip is certainly something that I will remember for life.